Frozen is one of our family favorites from Disney, since the movie came out in November, there isn’t a day that goes by where “Let It Go” doesn’t resound in our home. I absolutely love this movie because of it isn’t your conventional Disney story. Rather, it goes against everything you’d picture a Disney movie to be but, it is very empowering. My girls absolutely love this movie and even more because the two main stars are sisters. So naturally, when I asked the girls who they would love to dress up as, Queen Elsa and Princess Anna were on the top of the list. 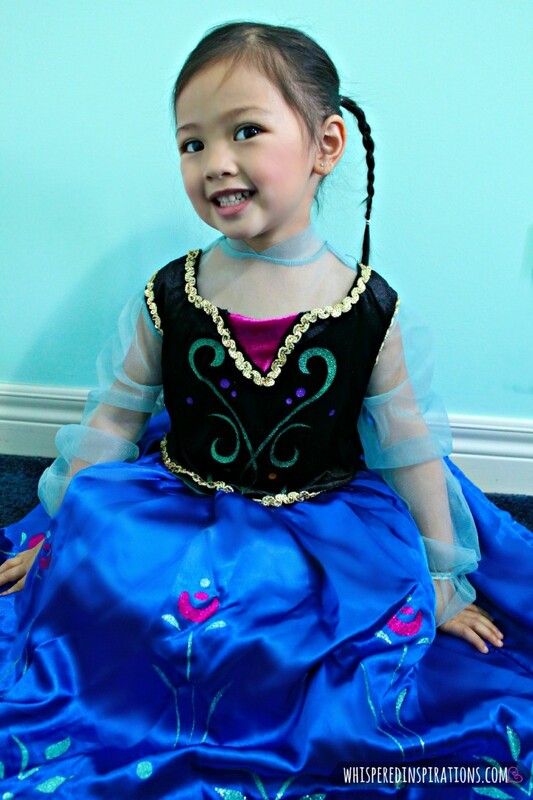 I had the chance to review an item from AnytimeCostume.com and of course we selected the Princess Anna costume. The costume is beautiful and has very delicate features. It is actually a 3-piece dress and includes a sheer dress, vest top and petticoat. 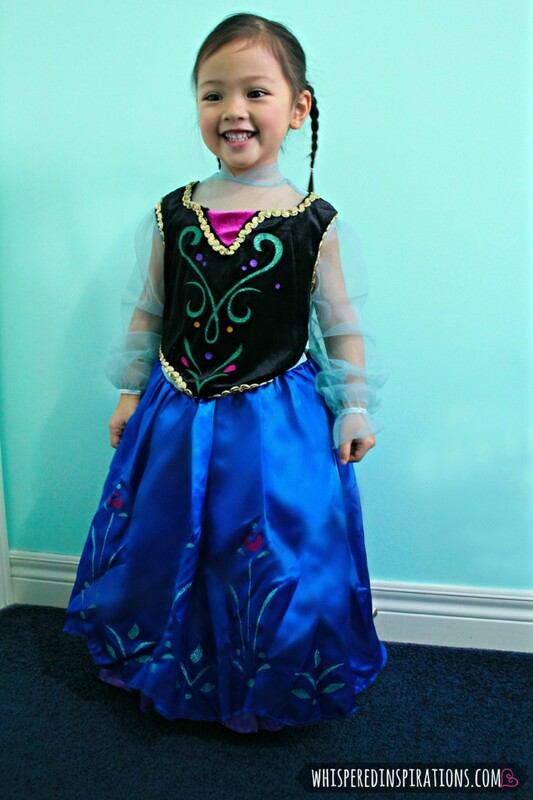 Your daughter doesn’t have to go on a freezing and dangerous adventure in order to get her hands on the Girl’s Frozen Anna Deluxe Costume, you could just get it at AnytimeCostumes.com. This outfit features Anna’s outfit from the new Disney film Frozen. This character is a Disney princess who must go find her sister and reverse the curse of an everlasting winter. She wears a dress with a black bodice with green designs and flower accents. The dress also has long sleeves that are a sheer blue coloring. The skirt is a dark blue and has flowers printed on it too. Anna must go find her sister the Ice Queen and reverse her curse before it’s too late. It’s never too late to grab this amazing costume though. There’s something magical about being a Disney Princess and I love that Princess Anna is headstrong, unrelenting and confident. I have a feeling that come October, these costumes are going to be the must-have costumes of the year. Anything Frozen! If you haven’t had the chance to go to the theatre and watch it yet, here is the official trailer. And c’mon, you’ll love Olaf, I fell in love with him. 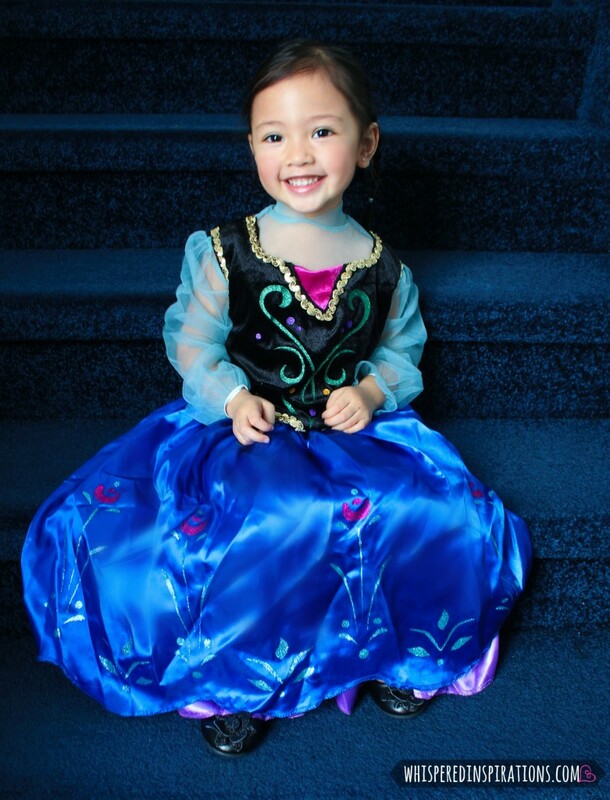 Mimi is having a blast acting out and singing her favorite songs, “Love Is An Open Door”, “For The First Time in Forever” and even “Let It Go.” This costume is perfect for dress-up and it can be used over and over again. What I love about the costume is the detail. The vest is beautiful and the sheer sleeves and neck of the dress are delicate and feminine. Not to mention, I adore that the dress has volume because of the liner underneath. And we are in love with this costume. When it comes to getting costumes for dress-up, Halloween or a party, you can always count on ordering exactly what you want from AnytimeCostumes.com. Every single time that I’ve ordered online, it fits perfectly. It’s easy to order and I love how they have a size chart so that you can measure to perfection. What or who do your kids love to dress up as during play time? Oh my gosh! She is ADORBS!!!! Ummm…my little one would freak if she got one of those costumes! She's all over Frozen and anything Disney princess related. She's even got an entire closet just for her costumes. No joke. LOL! Ohh that's an adorable costume! My son used to dress up as a dinosaur almost everyday. Now as they get older it's all about the scary stuff. I love that Anytime Costumes has stuff for all ages. When they were young, my girls played dress up around the clock. They would have worn their costumes to bed if they could! Any costume I bought was certainly money well spent in terms of encouraging creative play. And princesses always topped the list. My daughters would absolutely love this…though they would insist on a wig too! My daughter is going to LOVE that. So sweet. We loved the movie, too! What a gorgeous Princess Anna!! That is a great costume! I love how well it fits your daughter!! The colours are brilliant too!! Frozen is one of my fav Disney movies!!! I was surprised by how much I liked it!! OMGosh she is the cutest princess ever!!! I have the costume to and it looks cool on your girl and also I got the one from the Disney store that is limited edition and then again it looks Cute on your girl!!!! This is adorable! The costume looks great! Thank-you, it is a very nice costume. She loves it. 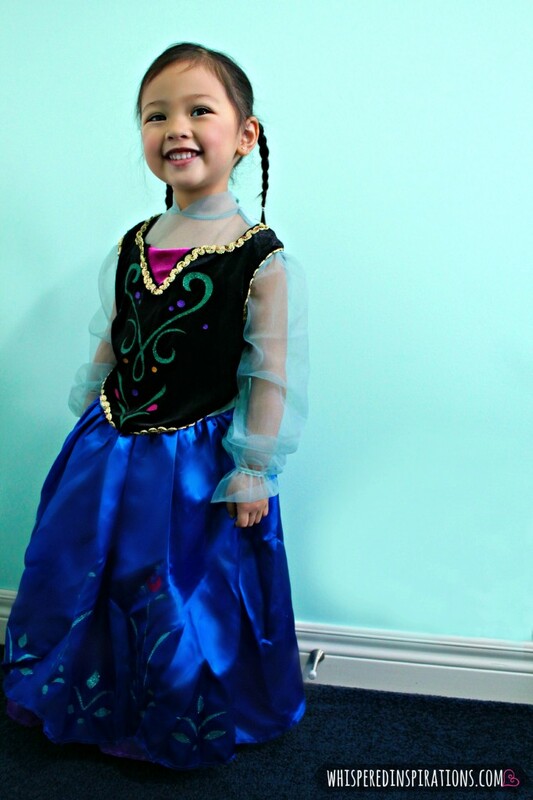 I know a little girl that would LOVE the Princess Anna costume! I will have to check out their site! That dress is so cute. My daughter loved the movie Frozen. Awesome and amazing look !! Where can I find the model to built the Anna's Dress? Hi there Charlotte, you can find them in the links in my post. I added where I got it from. These photos of your daughter are so nice! Thanks for the link you shared !